Over a billion people visit Google every day. Today they will be met by Google’s protest over the violations of gay rights in Russia as the Winter Olympics get underway. 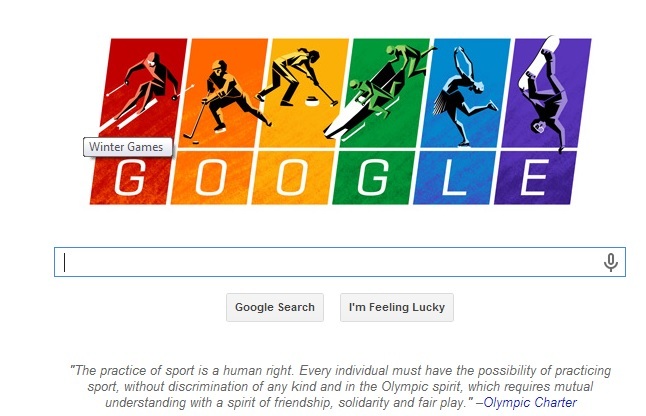 In case the rainbow doodle left you in any doubt, Google then quote the Olympic Charter underneath that states that “every individual must have the possibility of practicing sport without discrimination of any kind”. Left Foot Forward today have given us ‘5 good reasons why LGBT activists are protesting against Russia‘ – many of which result in the Olympic Charter being little more than an aspiration for an openly gay athletes in Russia. Google were joined by Channel 4 who also turned their logo rainbow for the day. The TV channel stated that they wanted to wish good luck to all athletes competing at the Games – gay or straight. Hynd’s Blog tips its metaphorical hat to Google, Channel 4 and the transformative power of sport.